"This book tells the remarkable story of a neurosurgeon's quest to unravel the mystery of the link between our brains and our hearts. From the moment in his childhood when a simple act of kindness changed the course of his own life to his founding a center to study compassion at Stanford University. Jim Doty's life illustrates how each of us can make a difference. We can make the world a more compassionate place. I’m sure many readers will be moved by this inspiring story to open their hearts and see what they too can do for others." “Into the Magic Shop offers a gripping, well-told journey into the mysteries of the human mind and brain. 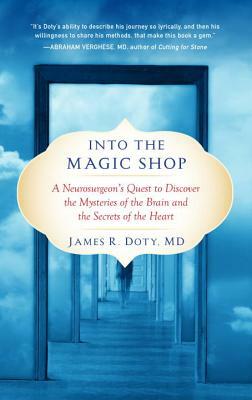 Neurosurgeon James Doty has written a heartwarming tale of courage and compassion." "Into the Magic Shop is a captivating journey of discovery. Neurosurgeon Jim Doty's well-told personal story illuminates for us all the power of insight and empathy to transform our lives and enhance our world. Read it and you too may find magic in the mystery and majesty of the mind to bring health and healing to our individual and collective lives. "A powerful, eloquent, deeply spiritual and exquisitely beautiful book. Real magic!" "Dr. Doty’s powerful book, Into the Magic Shop, is a testament to how faith and compassion extend beyond religion, race and nationality and can help an individual overcome adversity and personal limitations. It is an inspiration." "An optimistic and engagingly well-told life story that incorporates scientific investigation into its altruistic message."